One of the things that brings pleasure to time spent outdoors in the summer garden is the company of butterflies, often referred to as "flowers that fly." Every temperate or tropical climate hosts numerous species of these colorful winged insects, regarded as gentle because they cannot bite or sting. Yet butterfly larvae are another matter altogether, because all butterflies spend their larval period as leaf-eating caterpillars. Fortunately, only a few butterfly species use fruits and veggies as their larval host plants. The larvae of cabbage white butterflies are green cabbageworms, and tomato hornworms are the larvae of a large, showy moth. Both of these pest species are easy to control by hand-picking or spraying with a Bt insecticide. A third type of butterfly larvae found in veggie gardens, parsleyworms, mature into beautiful black swallowtail butterflies, so they are worth tolerating in small numbers. Last summer, I left an almost-mature parsleyworm on a bulb fennel plant, and a few days later noticed a cocoon attached to an upright grass. I checked on it when I remembered, and got lucky one morning when the newly emerged black swallowtail basked in the sun, preparing for its first flight. Now that’s a great garden moment. Encouraging butterflies to visit your garden is a simple matter of growing butterfly-friendly flowers. Flowers that attract butterflies provide nutritious nectar that can be sipped through the proboscis, an organ resembling a telescoping drinking straw. Operating a proboscis while balancing a pair of huge wings on one’s back is easiest when firm footing is available, so most flowers that attract butterflies also provide flat petals or leaves for standing (echinacea, monarda, zinnia) or the flowers are borne in dense clusters on stiff stems (butterfly bush, lantana, verbena). 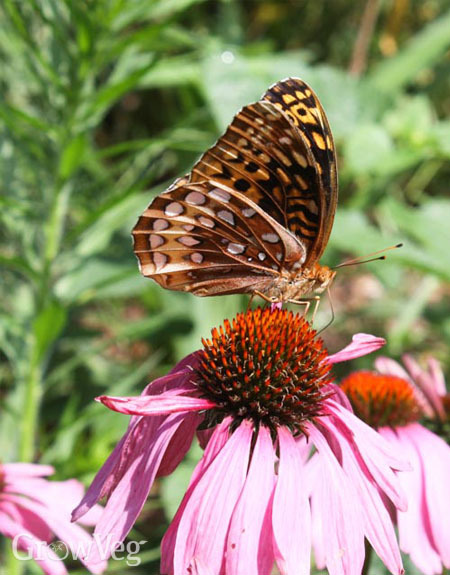 Butterflies crave nectar from many native plants that we consider weeds, and some species are worth tolerating in the name of butterfly conservation. For example, the flowers of many thistles are potent butterfly magnets, but you must remember to chop down the plants before the seeds can ripen. I also allow milkweed to grow in patches, because no butterfly can pass without stopping when the milkweed blossoms are pumping out nectar. More importantly, milkweed is the preferred larval host plant for increasingly threatened monarch butterflies. Urbanization and industrial agriculture have led to a critical shortage of available milkweed, so my little plots could actually be lifesavers to desperate monarchs. Willows and poplar trees are host plants to several butterfly species, and most trees are not weakened by leaves lost to hungry caterpillars. And, though the digestive systems of butterfly larvae are usually equipped to handle only one type of plant tissue, in some cases butterflies have been able to adapt to change.